BEIRUT (Reuters) – Kuwait will host an international conference next month to tackle Syria’s humanitarian crisis, the ruling emir said on Monday, as foes of President Bashar al-Assad voiced frustration with international efforts to end the civil war. In Damascus, special international envoy Lakhdar Brahimi metAssad but the Syrian opposition vented its anger at what it called a “silence” over the unabated killing of civilians by governmentforces, most recently in the central town of Halfaya. Brahimi’s plan for an end to the Syrian crisis centers on a transitional government, but has left vague Assad’s role. The opposition rejects anything but Assad’s overthrow and says the governmentcrackdown has been too fierce to accept dialogue. In Moscow, Foreign Minister Lavrov told the Russia Today (RT) television channel that recent signs that parts of Syria’s chemical arsenal were being moved – a development that alarmed Western governments – was an effort by the government to make the weapons more secure. “Our information is … that the latest reports about some movement of the chemical weapons was related to steps undertaken by the government to concentrate the chemical stuff … at two sites, to make sure it is absolutely protected,” he said. 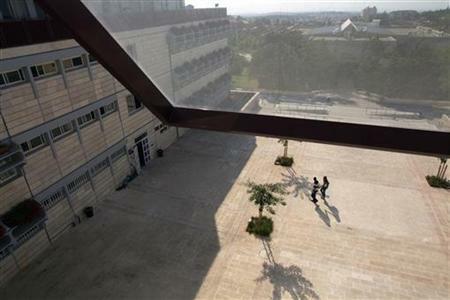 JERUSALEM (Reuters) – Israel upgraded a college in a West Bank Jewish settlement to a university on Monday, reflecting a determination to keep control of the enclave in any peace deal with the Palestinians. The decision gives the Ariel campus, established in 1982 near the city of Nablus, the same status as universities inside Israel. It comes after Israel announced plans to expand other settlements on occupied land, drawing protest from European governments and the United States. The Palestinian Higher Education Office also condemned the decision and urged universities worldwide to boycott the institution. Most world powers see Israeli settlements on land that Palestinians seek for a state as illegal and an obstacle to peace. European nations and Washington have criticised Netanyahu’s plans to build as many as 6,000 more settlement homes, announced since a November 29 United Nations vote gave Palestinians effective recognition as a state and angered Israel. Israel has signalled it intends to retain control of several larger settlement blocs such as Ariel under any future pact, while the fates of other enclaves may be negotiated. During the last 2 years, a great campaign by the No to Veolia Action Group (NO2VAG) has worked hard in pressuring councilors to exclude Veolia from a £4.7 Billion contracts in north London. They have also submitted letters to North London Waste Authority (NLWA) documenting the illegal actions this Israeli profiteer has been committing and collected a petition signed by several thousand local people against selection of the company. Less than 2 months ago, Veolia failed to win Canterbury Council’s 40 Million GBP contract after facing determined opposition from the local community, including Palestinian rights campaigners, over its complicity with illegal activity in Jerusalem and the West Bank. In an announcement published 21st Dec, the NLWA confirmed Veolia Environmental Services had withdrawn its attempt to submit final tenders for both NLWA’s waste services and fuel use contracts. Veolia had been shortlisted for both contracts. “As the chair of Islington Friends of Yibna (IFY) my focus is on occupied Gaza, especially Rafah where Yibna refugee camp is. So when I found out that Veolia was bidding for contracts in north London, which includes Islington, I was reluctant to get involved. This is because the reason so many are outraged about Veolia is the infrastructure it builds in occupied East Jerusalem and the West Bank. But my dilemma became more personal when there was no sign of a campaign building up. I could not envisage that my own home borough, Islington, would become complicit with the company that facilitates the ethnic cleansing of the Palestinians. I took further encouragement when Palestinians from Gaza stated that in spite of the siege and the Israeli bombardments, it was important for them that Veolia was blocked. The letter outlined many unethical activities by Veolia, such as its involvement in the construction of the Jerusalem Light Rail which has been designed to connect the illegal settlements built on East Jerusalem with the Israeli territory of West Jerusalem. This violates International Humanitarian Law and the fourth Geneva Convention, article 49, regarding the Protection of Civilian Persons in Time of War. This is not the end of Veolia’s deep complicity with Israeli settlement activity since the company also operates bus services to illegal settlements as well as dump waste on Occupied Land at the Tovlan landfill. Veolia also published a racist classified advertisement for drivers that specified “completion of military service” and Hebrew as a mother tongue. It also announced that it would operate “kosher” train routes – segregated sitting areas for men (in the front of the train) and for women (in the back of the train). “As a group IFY decided to support the campaign to block Veolia on the grounds that fighting any of the Israeli war crimes would help in the fight against its crimes against Gaza. IFY then paid for the first legal work for No2VAG. While the Authority we were fighting, NLWA, refused to take into account the legal representations, it helped our understanding of the law and gave us the tools to challenge the NLWA.” Yael stated. More Contracts to Be Blocked! Due to companies like Veolia, Palestinians suffer a severe humanitarian impact including house demolition, murders and injuries and restriction of movement by Israel. The existence and extension of Israeli settlements in East Jerusalem and the West Bank are illegitimate, making Veolia an inappropriate partner for any public institution. As Palestinians facing a brutal and illegal occupation, local authorities and institutions are urged to follow the model set by public authorities and European banks that have chosen to disassociate themselves from Veolia and not to award it any public service contracts. Such action would contribute to upholding the rule of law and advancing justice and fairness for Palestinians. In Gaza, people thank all who joined the campaign. Thank you for your support and dedication. This is a major blow to companies that profit from war and apartheid and now they have finally seen that there are repercussions and there always will be. What I can see now is people around me in Gaza are jubilant and proud of the activists who are playing a great role to help and support us in Palestine. Today’s success further shows that there are strong and renowned international solidarity movements calling for justice. JENIN, (PIC)– The Israeli occupation authorities (IOA) refused to transfer the prisoner leader in Hamas movement, Sheikh Abdul-Jabbar Jarar, 46, to the hospital, despite the doctors’ recommendations that he needs an emergency surgery. She noted that his health situation has worsened when the Israeli authorities have renewed his administrative detention, despite the Israeli appeal court’s decision to release him. She added that they refused to treat or release him. “There was an attempt to provide the necessary treatment for him, but they refused, despite his suffering, especially after declaring his hunger strike with the prisoners,” she explained. Prisoner Jarar’s wife appealed to humanitarian and international institutions to bear their responsibility towards her husband, especially that he suffers from a serious life-threatening condition. A SAUDI Arabian liberal writer has been arrested for making comments on his Twitter account that are allegedly insulting to Islam, family members say. Turki Ahmed was arrested on Monday on orders of Interior Minister Prince Mohammed bin Nayef bin Abdel Aziz, who was tipped off by a religious organisation, they said. The interior ministry did not confirm the arrest, however, and its spokesman was unreachable for comment. Ahmed on his Twitter account attacked radical Islamists he said were twisting the Prophet Mohammed’s “message of love” and what he described as “a neo-Nazism which is on the rise in the Arab world – Islamic extremism”. His comments provoked fierce debate on social networking sites in Saudi Arabia between his supporters and detractors. Online activist Raif Badawi, another Saudi, was arrested in June in Jeddah and accused of apostasy, which carries the death penalty in the Gulf kingdom. Badawi helped set up a liberal Saudi website, which declared a “day of liberalism” on May 7, calling for protests against the stranglehold of religious officials on public life in the strict Sunni-ruled monarchy. Amnesty International condemned Badawi’s prosecution. “Raif Badawi’s trial for ‘apostasy’ is a clear case of intimidation against him and others who seek to engage in open debates about the issues that Saudi Arabians face in their daily lives,” said Philip Luther, director of the organisation’s Middle East and North Africa division. “He is a prisoner of conscience who must be released immediately and unconditionally,” he added. The exodus has emptied hundreds of the safe houses, apartments and refu­gee tents that housed Syrians in Mafraq and other northern Jordanian cities, according to Syrian activists and Jordanian officials. Jordanian security officials, who spoke on the condition of anonymity because they were not authorized to speak on the record, said as many as 8,000 Syrians have crossed the border back into Syria in the past 10 days alone. According to Syrian activists in Syria and Jordan, the sudden returns are a response to a call for reinforcements issued in early December by the rebel military council, the main umbrella organization of army defectors locked in a bloody war of attrition against regime forces loyal to Syrian President Bashar al-Assad. Activists said the response has been greatest among refugees in Jordan, because pro-Assad militias in Lebanon have prevented similar returns from that country and many Syrians in Turkey were already involved in the fight. Syrian rebels said the call for more forces comes as the opposition faces a critical stage in the months-long conflict, with their offensive inching closer to the heart of Damascus, capturing several military bases and fending off counteroffensives on rebel strongholds in Aleppo, the southern city of Daraa and the Damascus countryside. But even as they welcome the assistance, Syrian rebels play down the potential of new returnees to turn the war’s tide. Many of the exiles have no prior fighting experience. Others are months removed from the front lines and find themselves lagging in the rapidly intensifying urban warfare. “Each returnee needs at least two weeks to become acclimated with our current tactics and needs. It might be up to a month before they can really contribute,” Darawi said. Repeating a long-standing rebel plea, Darawi said more arms, not men, would give the opposition the final advantage over the Assad regime. But while Jordanian border forces largely turn a blind eye to the mass crossings, they continue to restrict the movement of weapons. Returnees are limited to carrying personal firearms and basic medical supplies, not the heavy artillery and surface-to-air missiles FSA officers say they need to topple the regime. “We will not prevent Syrians from their right to return, but under no circumstance will we allow arms smuggling through our borders,” said a Jordanian military source stationed in the border region. Even so, optimism about rebel gains has buoyed Syrians who remain in Jordan. In recent weeks, they have launched a flurry of new coalitions and formed unions for lawyers and civil servants in anticipation of a post-Assad transition phase. Recent rebel attacks on the international airport in Damascus and the takeovers of other military airstrips have inspired 150 defected Syrian military pilots in Jordan to form the foundation of what they hope to be the FSA’s first air force squadron, said Lt. Col. Abu Abdullah Mohammed. The former pilots say they are set to return once rebels have successfully captured an air base or airport where they can put their skills to use. The recent departures represent a small fraction of the Syrian population in Jordan. But they have left a palpable emptiness in the apartment blocks and houses in Mafraq that, mere weeks ago, were crammed with refugees, many of them hosted by Jordanians. On a recent day, Jordanian Abdul Rahman Talal, a household appliance importer and a supporter of Syrian revolutionaries, stood in his carpeted living room and furrowed his brow as he pondered a sound he had not heard in more than 20 months: silence. Until early December, his home in this border city had served as a safe house for 30 Syrian rebels. Then, suddenly, his guests headed for the front lines back home. Jewish immigrants of the Bnei Menashe tribe of the Jewish community in Manipur, northeast India, wait to be reunited with family members as they arrive at Ben Gurion airport near Tel Aviv on December 24, 2012. Hospitals and clinics in Gaza continue to struggle with a shortage of medicine and surgical supplies, more than a month after Israel’s onslaught on the besieged enclave,Press TV reports. Palestinian doctors say the situation is especially dangerous for patients with chronic diseases who require constant treatment. Meanwhile, human rights activists have called for stronger international action against the Israeli regime to pressure it into lifting its illegal blockade on the improvised sliver. “People in Gaza suffer from this siege, especially after the Israel military operation on Gaza. I would like to ask our governments and European institutions to act in order to lift this siege,” said Rosa Schiano, an Italian activist in Gaza. Over 160 Palestinians, including many women and children, were killed and about 1,200 others were injured in the Israeli attacks on Gaza during November 14 to 21. The recent Israeli war on Gaza was Tel Aviv’s second in four years. The Israeli regime waged a 22-day war on the densely-populated Palestinian enclave in 2008, killing more than 1,400 Palestinians, including at least 300 children. JERUSALEM (Ma’an) – Extremists in Jerusalem have invented a bizarre new method to insult Palestinians and the Muslim religion. “For Sale” signs placed on used cars around the city with phone numbers lead potential buyers to a recorded message profanely insulting Palestinians and the Prophet Muhammad. Hamza Mahmoud, a resident of the Old City, told Ma’an that he and several others tried to call numbers they found on cars for sale and they heard racist insults and curses. A Ma’an reporter tried one of the numbers and was led to a profane recording by a male speaking Arabic in a Hebrew accent. That number was 054-6032825. Jerusalem-based journalist Jihad Zghayyer told Ma’an that he received complaints from residents saying they were tricked into calling in an attempt to buy cars, and the result was the same. He highlighted that it was common to see such cars with “For Sale” signs on the main road between Jerusalem and Bethlehem where Palestinian workers frequently travel. Palestinian residents complained about what they described as a racist phenomenon to lawyers and Arab members of Knesset. Israeli police spokeswoman Luba Samri told Ma’an she was unaware of the issue and said the authorities would act only if they received a complaint from residents.